Horsley, Richard A. Performing the Gospel: Orality, Memory, and Mark. Minneapolis, MN: Fortress Press, 2006. Pp. 239, and Shiner, Whitney. Proclaiming the Gospel: First-Century Performance of Mark. New York, NY: TPI/Continuum, 2003. Pp. 214. 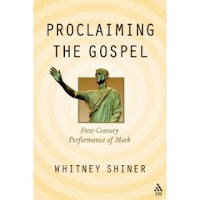 In this post, I am going to offer a brief review of two books that shared similar foci: Whitney Shiner’s Proclaiming the Gospel and Richard Horsely’s Performing the Gospel. Probably, of the two, Shiner’s title is the most accurate. In his work, he deals with performance in the ancient world and its myriad elements. However, in each chapter, he ties that in with Mark’s Gospel. For example, in the 9 main chapters, he deals with: Oral Performance, Types of Performances, Emotion, Delivery, Memorization, Gesture/Movement, The Audience, Applause Lines and Including the Audience. Shiner applies each of these to Mark’s work in a creative and detailed manner. That makes this book not only a good resource for Markan studies but also research in ancient theater (e.g. drama, tragedy, public speech, etc.). As for Horsely’s work, while the title isn’t terribly off, this is another book where the subtitle is more accurate: Orality, Memory and Mark. Composed as a tome of essays, this book is divided into three sections. The first section deals with literacy and orality in the ancient world. The second part, building on the first, deals with literacy, orality and memory in antiquity. The third part, rooted in the previous chapters’ research zeroes in on orality, literacy and memory as they apply to Mark. In all thruthfulness, not much is said concerning Mark’s Gospel in the first two sections. These partitions are very scholarly and attempt to construct an erudite framework for Mark’s Gospel. One of the great things about Horsley’s work is that it is learned, articulate and trend-setting. Another plus is the attempt to engage portions of the Hebrew Scriptures to illuminate Mk. Just as well, the close attention paid to the culture of the first century Mediterranean is impressive. One of the downfall’s of this book is that for those interested primarily in Mk., it seems like it takes a while to even get to Mk. Perhaps a title change would work in this tome’s favor. In regards to Shiner’s book, there are many wonderful things I could say. His interaction with primary sources, his clear style of writing, his creative approaches, his detailed analyses, his in-depth look at ancient performance and his constant appeal to Mk. is nothing short of top-notch. Actually, my favorite chapter out of the work edited by Horsley is actually written by Shiner (chapter 9: Memory Technology and the Composition of Mark) which is a “must read” essay. While I do not subscribe to everything Shiner says (e.g. his view concerning the date/setting of Mark’s Gospel), I find a great deal of what he has to say quite appealing. In the end, both of these are great works. The Horsley text is more technical and may not be for the common reader. Still, it is a great contribution to the field. The Shiner book is an excellent addition to my personal library and I am thankful to Continuum for sending it.